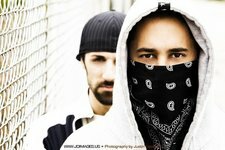 The fierce duo collaboration between rapper, The Prophet, and producer, Nima Fadavi came about in early 2006. At the time, The Prophet was signed to CMe, Avatar, and Universal records, and had just finished his first major label release, "Sworn In," when he was beginning to work on his second. Bringing in Nima to produce a few songs, the two began working more and more together. The beats Nima produced had a strong hip hop influence, but also brought in different elements of reggae, and carried a unique original style that blended multiple genres. The distinctive, fast, catchy rapping style of The Prophet seemed to form perfectly to the beats. Shortly after working together, The Prophet decided to end his contract with CMe, Avatar, and Universal records and pursue working on a full project with Nima. Both individuals, already accomplished musicians, seemed to have no problems getting their new project on its feet. Rise of the Revolution is music that speaks the truth, with strong political lyrics, backed by catchy, creative, and original sounding beats. Music that touches on every emotion and encourages standing up for what you believe in. Although influenced by many different artists in many different genres, the two have seemed to find their own unique hip hop sound. The focus of Rise of the Revolution is to pursue creative music as a form of art with a positive message. The music is the sounds for life and being true. Speak out, rise up, and stand. The live performance that has been regarded as loud, powerful, and rowdy, the two seem to always feel comfortable on stage. The Prophet and Nima Fadavi both on the mic's, while Nima plays the organ and the beats live also. You can also catch them performing live with friends who are on drums and the turntables. Collectively and individually, they've shared the stage with Immortal Technique, Dead Prez, Collie Buddz, KRS-ONE, Zion I, Hieroglyphics, Aesop Rock, Andre Nickatina, Devin the Dude, Murs, The Grouch, Xzibit, Twista, Pitbull, J Kwon, Dub C, and many more. Their debut album "Never Stand Down," was released in August of 2007 under their own label, Eclectic Sound Recordings. Drawing strong live instrumentation on the album, it also combines hard hitting drums with tracks that have everything from a dark symphonic feel to tracks that have a upbeat bright feel. The album includes special guest appearances from The Grouch of Living Legends, and many more. Constantly on the road or in the studio, the duo are currently working on their 2nd album, Lethal of Equal, which is set to be released in the fall of 2008. We are our own movement, we are Rise of the Revolution.